Phoenix-based Bob Corritore is one of the most active Blues harmonica players on the scene today. His playing passionately carries forward the old-school style that Corritore learned in his youth from many of the original creators of Chicago Blues. Corritore’s energetic and fiery harmonica playing has been featured on over twenty-five releases to date, on labels such as HighTone, HMG, Blue Witch, Blind Pig, Earwig, Putumayo, Random Chance, and the VizzTone Label Group. Many of these acclaimed releases have been nominated for various Handy, Grammy, and Blues Music Awards. Corritore is also widely recognized for his many roles in the Blues, as bandleader, club owner, record producer, radio show host, arts foundation founder, and songwriter. More specifics about Corritore can be found on his website http://www.bobcorritore.com, where you can also signup for his weekly email newsletter. Bob Putignano for BluesWax: Hi Bob, good to see you again, it’s been a few years. You’ve been a busy guy. Bob Corritore: Good to see you, too, Bob and it’s good to see you’ve been pretty busy, too. I’ve been blessed as there are lots of good things going on for me in Blues. BW: Like early this morning when you were on Good Morning Arizona on TV. BC: Yeah, that was fun. We did a little preview for the Glendale Jazz & Blues Fest that takes place this very weekend [Editor’s Note: the festival took place April13]. Dave Riley and I did a couple of songs, but this weekend we’ll be with a full band. BW: Plus, this Friday and Saturday night at your club the Rhythm Room. BC: Yep, with Big Pete [Pearson] and the Rhythm Room All-Stars. BW: I’ll be looking forward to seeing you tomorrow night at your Rhythm Room, and, yeah, it’s a nice lineup for this weekend’s festival. BC: Roomful of Blues, Mark Hummel, Tommy Castro, and on the Jazz stage I’m excited to see David Fathead Newman, too. BW: And Stanley Jordan, as well. BC: Right, Stanley lives nearby in Sedona, so he’s no stranger to Arizona. BW: Does Stanley play at your club? BC: Absolutely! 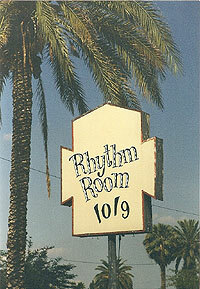 Stanley’s played the Rhythm Room several times. BW: Speaking of the Rhythm Room, I recently saw an article in Relix magazine about your club where a band called Eoto (which has members from the String Cheese Incident) was reviewed from a live performance. Do you book other genres of music or are those rentals? BC: It used to be that we had the luxury of booking Blues and roots seven nights a week, but ever since 9/11 things just changed in our society, people can’t go out like they used to. So I had to quickly adapt to this new reality that I had to mix things up and bring in non-Blues bands from time to time from independent promoters who will rent out my room. But the Blues stays on every Friday and Saturday nights and for special situations, like on Monday we’ll be doing a benefit for Candye Kane, who also is no stranger to Arizona. What’s cool is that it has kind of really worked for the Blues as I have seen people who came to an indie Rock shows starting to show up for our Blues events, it seems like the younger folks like the room. BW: I have not been here at the Rhythm Room for several years, but I did like the vibe there, it’s a really cool room. BC: I think you will like the improvements as well; we’ve added a patio and the parking lot has been improved, too. BW: Speaking of the parking lot, what I also remember was the sausage guy in the lot. BC: Sonny! Unfortunately Sonny passed about a year ago, but Sonny was part of the personality of the club. 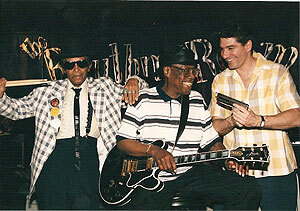 We also recently lost Chico Chism, who also was so much a part of the fiber of the Rhythm Room. Chico always held court in the room and if you look at my desk, that’s Chico’s hat, so I think of Chico daily. He was my best friend for twenty years living in Phoenix and he brought me so much joy. BW: Did you know him from Chicago? BC: Yes, I first saw Chico when he was playing with Howlin’ Wolf and I invited him out to Phoenix for six months to do some gigs and he liked it and he stayed! He was my partner in music and a dear friend. BW: You’ve developed quite a Blues scene here, in an area that’s not really well known for Blues. BC: Pure stubbornness! The club’s been open since 1991 and I am looking forward to our twentieth anniversary. Our ten year was unbelievable, a full day of bands with the Holmes Brothers finishing up the night, plus a Soul review, fifteen bands in total, all day long. BW: You also are on the airwaves. BC: I’ve been doing radio for twenty-four years. BC: Soon to be twenty-five, KJZZ is public radio, which allows me to do Blues on Sunday nights; we have a strong following and have done well with our fund drives, too. It brings me great joy to share the music that I love. BW: You just had Bob Porter on with you. BC: Yes, for four hours, Bob’s been threatening to come out here to do radio with me for years and we just did it a few weeks ago. BW: I just did a TV show with Bob Porter, ex-Rolling Stone editor Anthony DeCurtis, and Bob Weir for the Madison Square Garden Network cable station in New York, Connecticut, and New Jersey, where we all made comments about Lightning In a Bottle. What was also cool was that they filmed us where the performance originally took place – inside of Radio City Music Hall. BC: Great! It was a very good movie. I really enjoyed it a lot so that must have been fun to do. In fact, somewhere around here I have a photo from, I think it was Vanity Fair magazine, which had a great group shot of all the performers. You know several of those performers are no longer with us now, which really makes having these performances so special. BW: That’s why guys like you and I always tell people to get out there and see these musicians, you just never know how long they might be around. Who are some of your favorites? BC: Well, I miss Robert Lockwood so much, I was also crazy about Jimmy Rogers, who was one of the greatest Blues singers ever. Tomcat Courtney, Dave Riley, and Big Pete Pearson are some that I have worked with that I think the world of, too. I love this guy Jimmy Duck Holmes. I was also a big fan of R.L. Burnside. But my biggest favorites are the Chicago guys, Henry Gray and Pinetop, Big Moose Walker who was a great friend of mine who I played with in the Seventies. 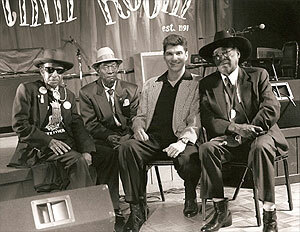 Of course Muddy and Wolf, Big Walter Horton, and Snooky Pryor who just left us recently. Fortunately we still have so many great players that are still out there, but the list of the originals is getting smaller. John Brim is gone, my friend Chico Chism has left us, there are a lot of people we’ve had to say goodbye to, which of course is not fun, but we still have their music that lives on and have seen their performances that meant and still mean so much to us. So it becomes your and my responsibility to keep that alive. BW: And to go on and build upon that, which is what you are doing with the Rhythm Room, by having other genres of music there that hopefully will get turned on to the Blues. BC: We always want to be sure we continue to grow the Blues. My radio program is very traditionally based, there is so much to be said for the originators of the Blues that defines the music, it still sounds so fresh to me and so full of life. So much so that when those of the iPod generation get turned onto a classic piece of Blues and say “Wow, where can I download this?” That’s a success. BW: Success for sure, but I worry about the downloaders not seeing the liner notes and the backing players; it’s a special ipod listener who is going to research all of the details that we were and still are so used to reading from the LPs and CDs. BC: I see the iPod as what cassettes were to us, it’s just a different world now. CD sales are great off the bandstand now, but record stores are in a bad place these days. Everyone is trying to figure out what’s next? I still believe that people want to take something home with them from a show that they can hold in their hands. BW: With a signature from the artist, too. BC: Yes, plus that personal shake of the hand, which will remind them of the performance they’ve just seen. You remember when LPs were surpassed by CDs and how important it was for us to have those beautiful 12×12 covers with the artwork and all. BW: And the ones that had gatefolds that opened up with more liner notes. BC: Sure! I remember that Blue Thumb record with Buddy Guy, Junior Wells, and Junior Mance, Buddy and the Juniors. I was still in Chicago at the time and this record store had a listening booth and it was pressed on marble vinyl. BW: That and the Dave Mason Along Together LP, Blue Thumb records was way ahead of their times. BC: Those were the joys of vinyl, picture discs and all! Come to think of it, some of the waitresses at the Rhythm Room don’t even know what a “45” is. I’m fifty-one years old and I come from a different place and time than they do, but I seriously take on the task of making people aware of that era we grew up in. Blues is a wonderful privilege to be involved in, it’s a beautiful body of work that is huge, that has all different kinds of flavors. Some like the Rock approach, others prefer Jazz-Blues, but it’s alright. I come from the Chicago Blues era and that’s what I mostly play, but I do love it all. BW: I read that you recently got the keys to the City of Phoenix? BC: Not the keys, but I got a proclamation from the city for a Bob Corritore Day, which I knew nothing about until it happened. They did this on my fifty-first birthday and I was throwing a party at the Rhythm Room to celebrate. It was a great day, Phillip Walker was at my club and members of the Mannish Boys came by, it was a great party. The next morning when I woke up, I was completely exhausted and thought today is just not my day. BW: Yeah, how do you top that? BW: Bob, it’s been a pleasure talking with you, is there anything else that you would like to add? BC: Thank you for taking an interest, Bob. I’m having a blast playing the Blues and I am thankful for all the people who have embraced the music and the things I try to do on air and onstage. 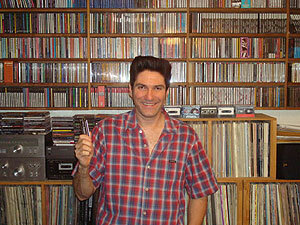 Bob Putignano is a contributing editor at BluesWax. You may contact Bob at blueswax@visnat.com.